Multilingual writing has been ubiquitous since — when? The ancient Romans used it to pay homage to their literary forebears and for expedient communication. Medieval poetry mixed Latin with vernacular languages. And the modernists, of course, delighted in linguistic collage. In the 1980s, Chicana feminists moved between Spanish, English, and Spanglish as they composed their autohistorias. Meanwhile in Quebec, Francophone and Anglophone feminists collaborated on translational corps/textes. Among contemporary writers, it seems that everybody's writing multilingually, drawing upon mother tongues, writing through translation, tracking sedimentary layers of Indigenous and colonial languages, or enacting the violent juxtapositions of geopolitical conflict. So where to begin? In my view, one of the most fascinating contemporary multilingual poems is Garry Thomas Morse's "500 Lines," which is the final poem in his book Discovery Passages. 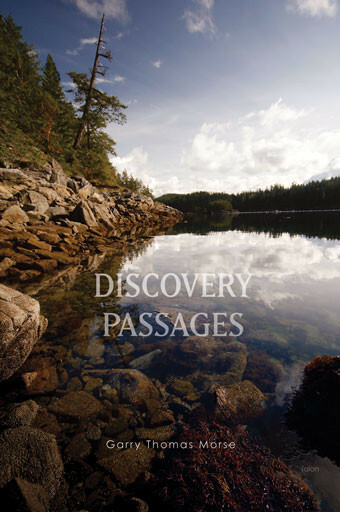 This book documents the stolen worlds of Morse's ancestors, retracing Captain George Vancouver's sailing route along the Pacific Northwest coast, from Alert Bay to Quadra Island to Vancouver, B.C. The book uses a variety of documentary and appropriative procedures, but "500 Lines" consists almost entirely of one repeated phrase: "I will not speak Kwak'wala." It appears 500 times, consuming nearly eleven single-spaced pages. Through the spare, conceptual technique of repetition, we are invited to imagine this sentence as a punishment: hard chalk clicking against the board, breaking and crumbling all the way around the classroom. A student has been caught speaking her mother tongue, and this is the cruel result. But Morse's poem doesn't represent any one student; rather, it represents the incarceration of First Nations children in residential schools, and the resulting decline of Indigenous languages in Canada. After the seemingly endless repetition of "I will not speak Kwak'wala," Morse includes two final lines: "Kwak'walamas? / K'i. K'isan kwak'wala." This isolated exchange repeats the punishable act, ending the book in the forbidden language. Perhaps we can interpret this as a hopeful ending. But a little research reveals that when translated into English these two lines read, "Do you speak Kwak'wala? / No, I don't speak Kwak'wala." Maybe the linguistic transgression in the closing couplet suggests that the schoolroom punishment has been overcome. But there is a certain ambivalence here: while the final couplet conveys an exchange between two Kwak'wala speakers, their skills are so rudimentary that at least one of them can only use the language to indicate her inability to speak it. Given their simple syntax and diction, these two lines could also represent an example in a textbook — perhaps these are the rudiments of Kwak'wala, a lesson not yet learned. Although both possibilities point toward linguistic revival, they also suggest the limitations and complexities inherent in reviving a language that claims only 200 remaining native speakers — less than four percent of the total Kwakwaka'wakw population. If this poem is partly about the shame of not being able to speak one's heritage language, maybe it is also about being implicated, even unwillingly, in the language's slow death. Morse's "500 Lines" directs our attention away from individual psychology and instead impels us toward the archives of policy and procedure, toward techniques of colonization and their ongoing effects. This poem avoids conferring subjectivity upon the young student or students whose punishment it depicts; there is no self or subject in the poem to anchor the experience. Instead, "500 Lines" attends to the rigorous distinction between "Indians" and "persons" codified in Canada's Indian Act (1876), and the ways in which this distinction was used to extinguish property rights and self-determination. This poem's relentless, desubjectivized form suggests the repetitive, systematic character of linguistic and cultural genocide, which was attempted — not to say accompished — through everyday punishments like the one depicted in this poem. When we focus on multilingual moments like the one at the end of "500 Lines," we are given a different way of thinking about poetic form, what it is for, and how it thinks. In asking that we attend to the untranslatable, to the unassimilable, multilingual writing also asks whose languages we are speaking, what languages aren't we hearing, which histories are contained within a word. To read multilingual writing is to trace the soft and sometimes permeable boundaries of our own ignorance. And that task, I think, is absolutely urgent.